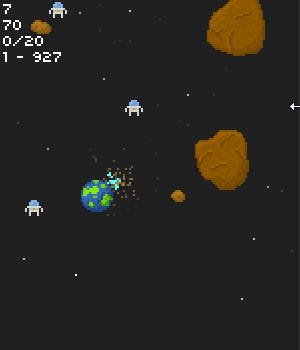 I have finally wrapped up development of SpaceJunk! I’m sure that some further testing will reveal some bugs, but that’s a given. The only thing left is a sound track. I took a crack at making music today but failed miserably. =[ I’m currently exploring some options as I cannot put SpaceJunk on FGL without a soundtrack! It’s not like I’d break a rule but I want it to be the best it can be. Speaking of which, I’m quite happy with how the project turned out. Originally I envisioned a totally different game, but as I progressed it evolved into something else. It’s quite hard too which I find the most pleasing. Most importantly though, SpaceJunk has allowed me to grow more comfortable within the AS3 language. don’t post blogs when tired. After my Love is in the Air, I immediately went back to sketching new ideas. It has been a tad bit more difficult than normal to come up with an idea that I want to work with. I’ve been messing around with a zombie rouge like that is similar to rouge survivor and a reincarnation of an old game I previously didn’t finish. While I believe that later would be quite successful in the flash portal, my drive seems to lie with the rougelike. But as most rougelikes, I have a feeling this will turn into a long term pet project which is fine of course. I just need to find something else to work with. I’m thinking…maybe a puzzle game for once? Something that doesn’t require predefined levels and that can be played over and over. I will think of something. My morning has been sabotaged by microscopic bacteria and the invading titian horde! The Humble Bundle 2 is now available for [insert your price here]. It contains Braid, Machinarium, Cortex Command, Osmos, and Revenge of the Titians. Most of the developer’s websites are down are ridiculously slow at the moment due the attention the humble bundle is receiving. Also note that it may take some time for your key to be sent to you, so don’t unload a bunch of emails asking where it is. All are great games well worth more than you’ll probably pay for them. ;] And remember part of your money goes to charity! On a side note: Puppy Games still has their bundle going (just visit their website and the offer should pop up) so you can have a complete Puppy Games collection by buying both bundles! I mentioned the humble bundle a few months back, just a few days ago I received an email letting me know the bundle is now available on steam! Now your friends will know when you are playing awesome games like World of Goo or Aquaria. Thats not all; the email also mentioned a second humble bundle coming soon!